We talked about my practice, my solo exhibition ‘Nuances of Life’ and the pros and cons of living and working in regional Australia. I have had a committed art practice for 16+ years, mainly focusing on abstract painting and mixed media artwork. To me, my art is freedom. It’s a way of giving the subconscious a voice without the restrictions and demands of the mind. 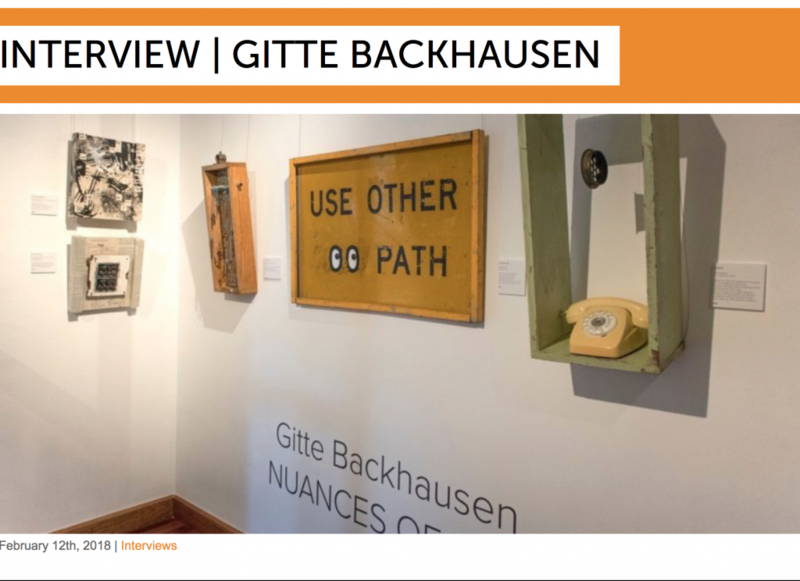 TODAY WE INTERVIEW ARTIST GITTE BACKHAUSEN, WHOSE EXHIBITION NUANCES OF LIFE IS CURRENTLY ON SHOW AT SHOALHAVEN REGIONAL GALLERY. CAN YOU GIVE US SOME INSIGHT INTO YOUR ARTISTIC PRACTICE? I have had a committed art practice for 16+ years, mainly focusing on abstract painting and mixed media artwork. To me, my art is freedom. It’s a way of giving the subconscious a voice without the restrictions and demands of the mind. The abstract expressionist movement, as well as systems theory, chaos theory and the notion of happen-stance, have been major influences on my practice. It has pushed me towards raw spontaneous visual expression and continues to inform my work. I have a degree in Applied Social Science and have always had an interest in human behaviour and psychology. This has also influenced my popular workshop ‘Get out of your Mind and into your Art’. In 2017, having collected old and odd objects for years, I had my first exhibition of assemblage work with great success. I find that this new way of working allows me to dig deeper and add a more psychological and philosophic aspect to my work. All my assemblages are accompanied by small poems, which help both me and the viewer connect to the work on a deeper level. YOU CURRENTLY HAVE AN EXHIBITION, NUANCES OF LIFE, AT SHOALHAVEN REGIONAL GALLERY. CAN YOU PLEASE TELL US ABOUT THIS EXHIBITION AND THE INSPIRATION BEHIND IT? The thinking underpinning this exhibition started on a morning walk. I walked by a newsagent with a poster out the front with the words “A day without laughter is a day wasted”. I thought to myself, what a narrow-minded statement. I’m not against laughing and I think it’s wonderful to approach life with a sense of humour, I think it’s crucial actually. However, I see something else in those words. I see society’s tendency to bombard us with suggestions of positive thinking and the glorification of so-called ‘positive feelings’. I see avoidance of the broad spectrum of feelings that life presents us with. I see a recipe for denial, failure and unrealistic goals. In western society, happiness is a highly valued emotional state and we are surrounded by positive quotes and motivational sayings. Happiness is not a bad thing, however, problems arise when we come to believe we should always feel this way. My exhibition Nuances of Life takes a stand against the focus on happiness as a goal and celebrates all aspects of life, through assemblage art and poems. 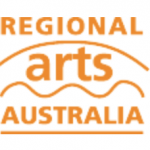 YOU LIVE AND WORK AS A FULL TIME ARTIST IN GERRINGONG, NSW. CAN YOU TELL US ABOUT WHAT A TYPICAL DAY LOOKS LIKE FOR YOU? I usually get up to do my fitness training or go for a walk first thing. The walking usually results in a few items being brought home, whether beautiful leaves I can use in collagraphs, a few rusty bottle tops or some discarded items that look beautiful to me. I love full days in the studio with nothing else to distract me, so I plan around that. I do need some human contact throughout the week, so I make sure to organise a few catchups on some of the days. We have a fantastic art community here, so I am active in participating in events and connect with other artist in the area. It’s good for my practice and important for me to stay connected and to contribute to the community as well. YOU WERE BORN IN DENMARK AND HAVE LIVED IN VARIOUS PLACES BOTH IN AUSTRALIA AND INTERNATIONALLY. WHAT DO YOU THINK IS THE BEST PART ABOUT WORKING AS AN ARTIST IN REGIONAL AUSTRALIA? It has been a game-changer for me to move to regional Australia. There are many ‘best parts’, including having the space to create. We live in a house with views over the green rolling hills with cows, the sense of space and connection with nature all making a huge difference to me. We were able to afford more physical space too (compared to the city), so I have a great big studio which is important for me to work freely and unrestricted. Another bonus is the very active, supportive and collaborative arts community we have, not to mention the simple fact that we actually know and socialise with many of our neighbours. Being an artist in this regional town has no doubt had a positive impact on my artistic practice and life as a whole. AND WHAT ARE SOME OF THE CHALLENGES THAT YOU FACE? The challenge with living and working regionally is that networking is difficult to keep up in the city (Sydney). It is difficult to build and nourish relationships in the art world and keep connected to ‘where it’s all happening’. It’s certainly a challenge for building ones career, but I value my practice higher than a potentially faster track to ‘being seen’. Another challenge is the distance and cost of transport of artworks to galleries in the city and the distance to shops with professional art supplies. It’s furthermore a challenge to engage in professional development, as many of the professional level courses are in the city as well. Yes there are online courses, but nothing beats the human connection in learning, in my experience. So yes, there are challenges, but nothing that outweighs waking up to the view of diary farm land with cute cows! FINALLY, WHAT IS THE NUMBER ONE PLACE YOU WOULD TAKE A VISITOR TO IN THE KIAMA REGION? The Little Blowhole Art Bar – a hidden gem outside main Kiama (4 Tingira Crescent, Kiama NSW 2533). It’s a tapas, wine and art bar. Not only do they have an exhibition opening every first Thursday of the month, they also offer live music on a regular basis and make some very yummy cocktails or a coffee, if that’s your thing. If you’re in the area, do check out Gitte’s exhibition at Shoalhaven Regional Gallery, on until Saturday 3 March, 2018. And if you can’t get to Nowra, check out Gitte’s Instagram.